Addictions don’t always come in the form of a pill, or a smoke, or a drink. One of today’s most wide-spread addictions, among both young and old, is social media. And while social media offers a lot of benefits to young people, it also presents numerous dangers. Fulton Police and DARE Officer Sophia Graves outside Fulton’s Municipal Building in late March. Photo by Randy Pellis. FULTON — When I was in fifth grade, the toughest choice I had to make was which baseball card to clothespin between the rear spokes of my three- speed English racer for that flap-flap sound that turned my bike into a motorcycle and me into James Dean. I didn’t have to choose whether to do drugs or not. There were no drugs. I didn’t even have to resist the temptation to smoke. No kids smoked, at least not in the fifth grade. And alcohol? Forget it. How was a fifth grader going to be drinking alcohol? And why would you anyway? No kids drank. We were all just riding our bikes. Girls were only just dawning on our horizons. By eighth grade, things were changing. I didn’t put baseball cards in my spokes anymore. I barely rode my bike. Girls were definitely in the picture now, and there were a few rough types of guys who smoked cigarettes. We called them “hoods.” One of them killed another in a fight in the woods behind my junior high. Hit him in the head with a brick. That was an awakening for us. Real violence barely existed in our world. But then, there it was. Still, alcohol was pretty much a non-entity. No one talked about it, though we figured the “hoods” were probably doing it somehow, somewhere. And drugs? Well, our eighth-grade health teacher was sure he’d scared the devil right out of us as far as drugs were concerned with his showing us, in all sincerity, the classic “Reefer Madness,” not as a joke, mind you, but as the gospel on the effects of marijuana. We didn’t have any marijuana anyway. We’d never seen it. We had no idea where it came from. We had about as much chance of running into marijuana as we had of running into Marilyn Monroe. And that was the world I grew up in. So, when I was asked to look into the DARE (Drug Abuse Resistance Education) program in Fulton’s schools and interview DARE Officer Sophia Graves of the Fulton Police Department, I was rather taken aback when she started telling me she was talking to Fulton’s fifth graders in all four elementary schools. What did she talk about? How to put a baseball card between the spokes of a mountain bike? “I follow a lesson plan,” she said, “and it’s really only specifically geared toward alcohol and tobacco, but a lot of times, those students will raise their hands, and they’ll ask about different drugs themselves. I won’t even say it. They already know about it. It’s out there. They’ve heard about it, they’ve had involvement whether or not it’s at home, or just outside of school, or over a friend’s house. So, a lot of times, these kids know a lot more than (you’d expect). We would be like ‘Why do you know about that already?’ So they’re exposed to a lot, and we want to make sure they’re making good choices about that stuff.” And that “stuff” isn’t just alcohol and tobacco. And as the scope of decisions to be made about drugs, alcohol, tobacco, and life in today’s world has widened over the years, so has the scope of the DARE program. Bullying is one of the big aspects of that wider scope. Of course, bullying’s not new. It’s been around forever. But what is new is the way DARE teaches young students to deal with it. Graves talks to her students about resisting peer pressure to join in with the bully and about ways to turn the situation around. Then she empowers them to be a positive influence in the midst of a bad situation. The DARE program, she said “is about being a good citizen, making good choices, and empowering others to make those good choices, trying to be a good influence, be a good role model, and being safe. That’s what it’s about. Violence, in general, is a main concern of DARE. Graves asks her students to think about “what other options you have. You don’t have to use violence. Look at all the different choices that you have in a situation. What’s going to be the best choice? A lot has changed within the DARE program over the 36 years of its existence, but Graves said a lot has changed too with students over her six years as a DARE officer and nine years with the Fulton Police. And it centers around mental health issues. But she remains undaunted and trusts in the scientifically-based 10-week curriculum she teaches. “They’ve done a lot of studies showing this is a beneficial program,” she said. 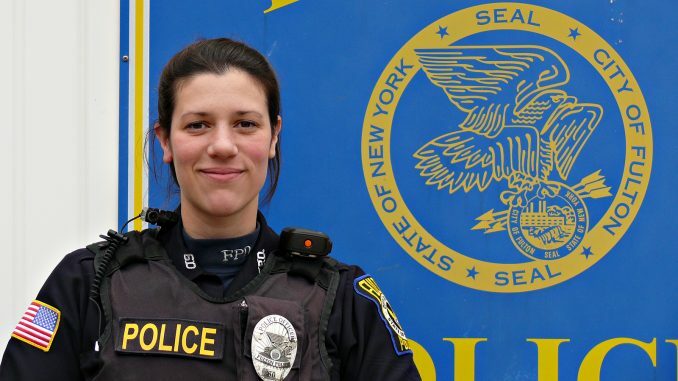 Graves grew up in Rochester, got her bachelor’s degree in human development at SUNY Oswego, bought and lives in a house in Fulton, and has been with the Fulton Police Department ever since. “We’re trying to teach students about everything in life, not just alcohol and tobacco. That’s just where we start. “Most importantly, it’s really about good decision making and making safe and responsible choices. A deep sense of community seems a big part of what makes Sophia Graves the dedicated professional she is. It means a lot to her that she lives in Fulton, works as a police officer in Fulton, and tries to help young Fulton students successfully deal with the many issues they face in a world far removed from baseball cards in bicycle spokes. She is committed to Fulton and committed to DARE.